A powerful American drama of seething intensity and savage beauty. 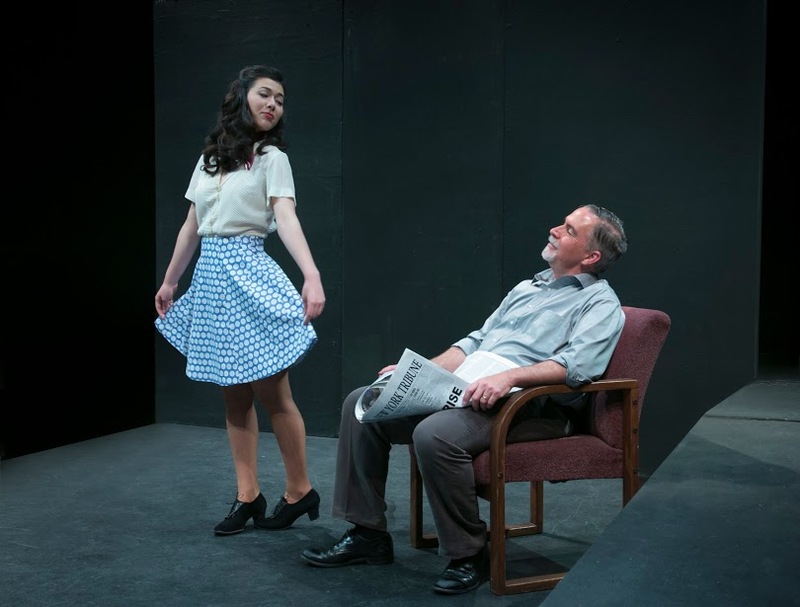 This 1955 drama has enjoyed renewed popularity in recent years, providing audiences with a pathway to engage in discussions about such modern issues as immigration and sexual identity through the lens of history. 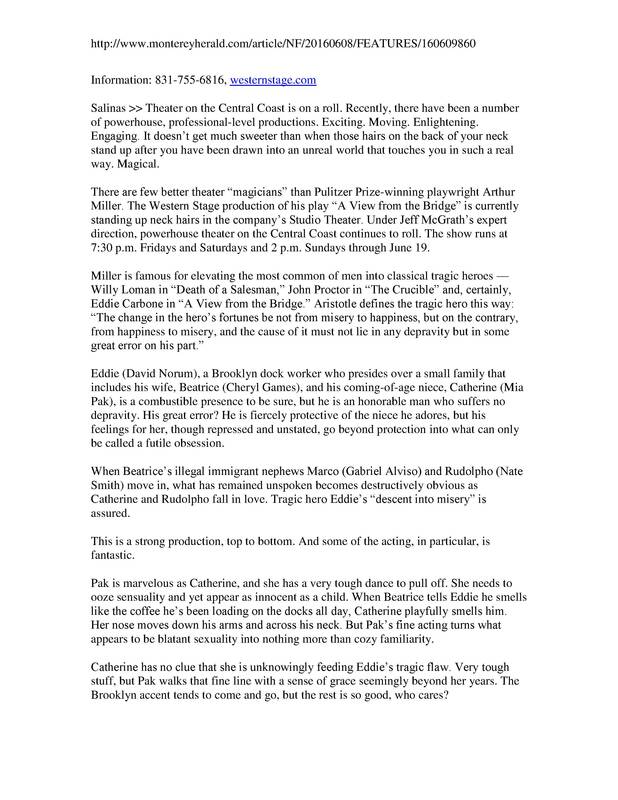 The play centers on the tragic story of Eddie Carbone, a longshoreman living in Brooklyn with his wife and her cousin. When they welcome into their home two brothers who have come to America for work, the atmosphere grows increasingly tense. Over time, Eddie’s paranoia about one of the brothers’ sexuality—and his interest in his wife’s cousin—leads to a series of explosive confrontations. 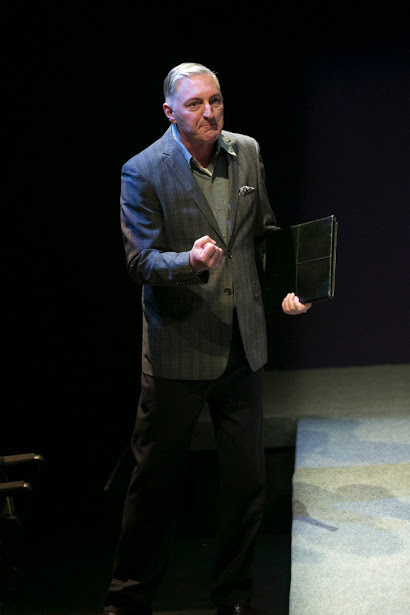 I play Alfieri, the lawyer who presents Eddie Carbone’s case to the audience and who, as a one-man chorus, invites them to share his own view from the Brooklyn Bridge. 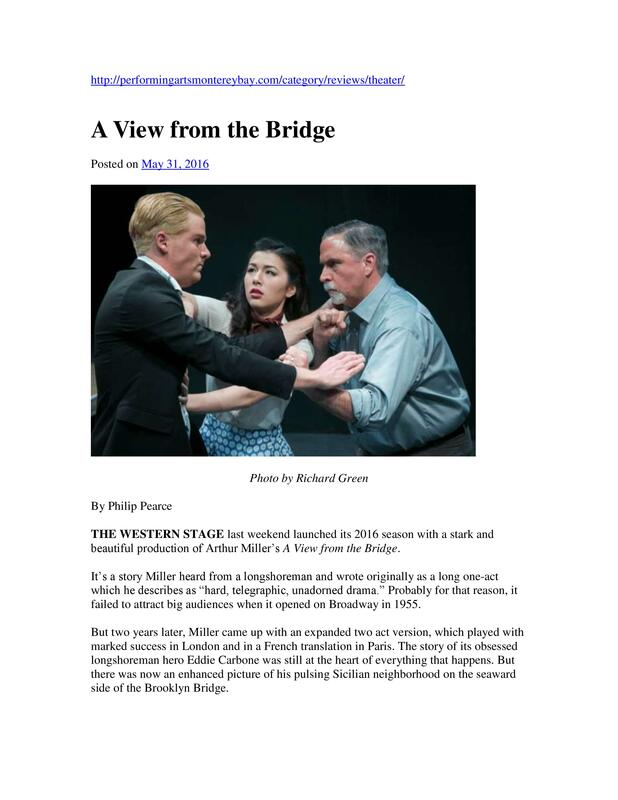 In this issue: “A View from the Bridge” is getting rave reviews! 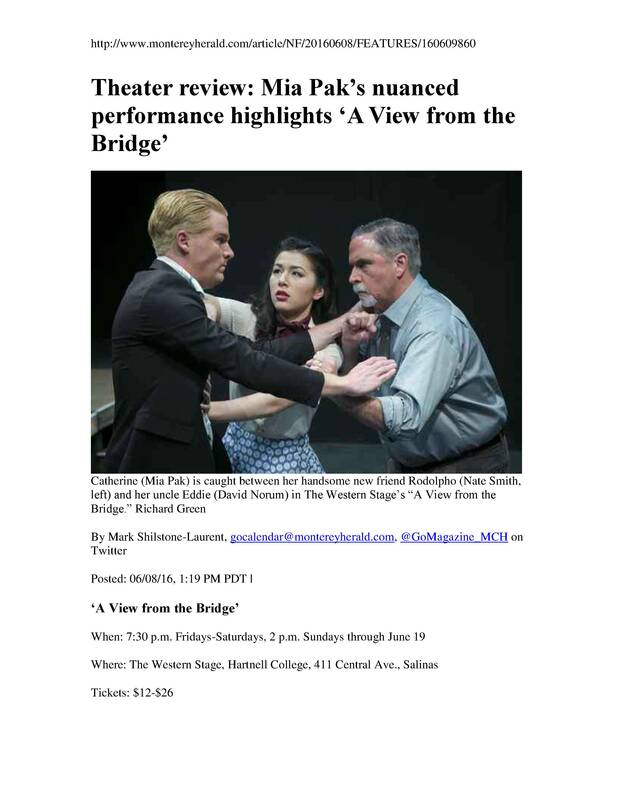 “If you go for serious, gut-punch drama, this production of A View From the Bridge won’t disappoint.” That’s the rave from the Monterey Herald, and we’re thrilled! 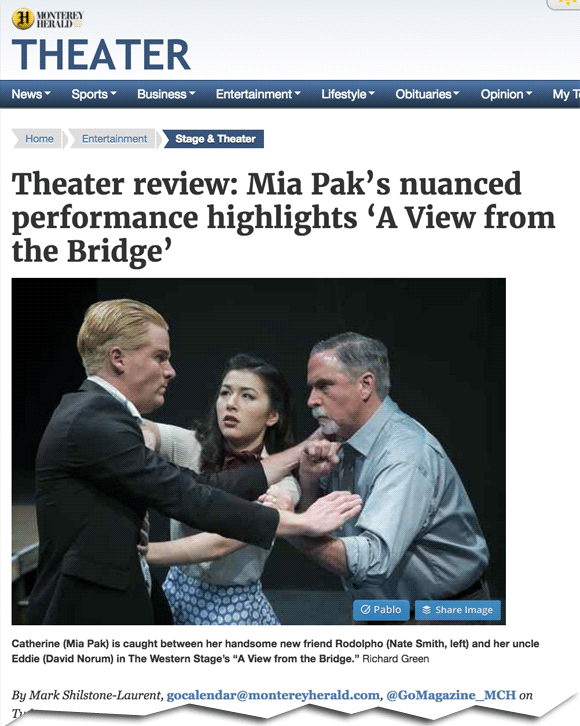 Phillip Pearce of performingartsmontereybay.com has tons of praise for the A View from the Bridge cast, saying the actors “work as a team with a selfless commitment to the material.” Read the full review. 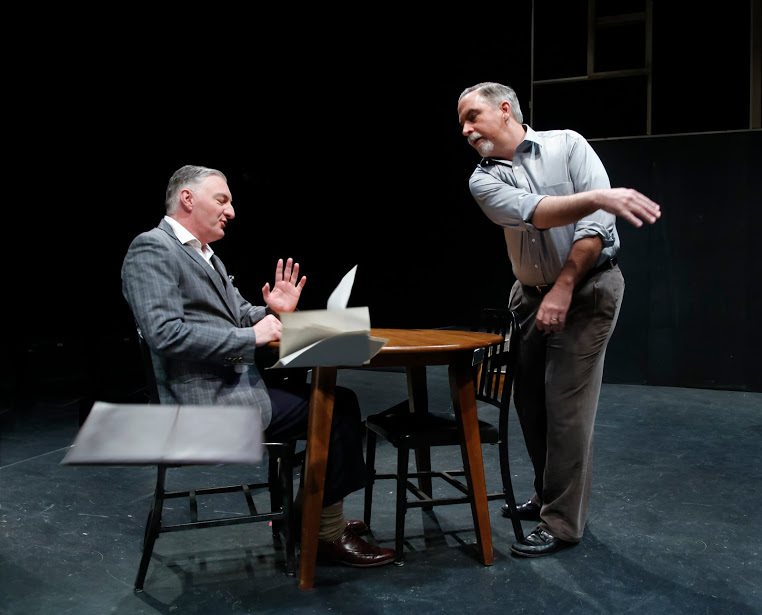 A View from the Bridge is one of Arthur Miller’s most gripping plays, and it remains as relevant today, exploring issues of family, immigration, forbidden desires, and aging. Meet the Carbones of Brooklyn and their newly arrived Sicilian cousins … and see what simmers and explodes. 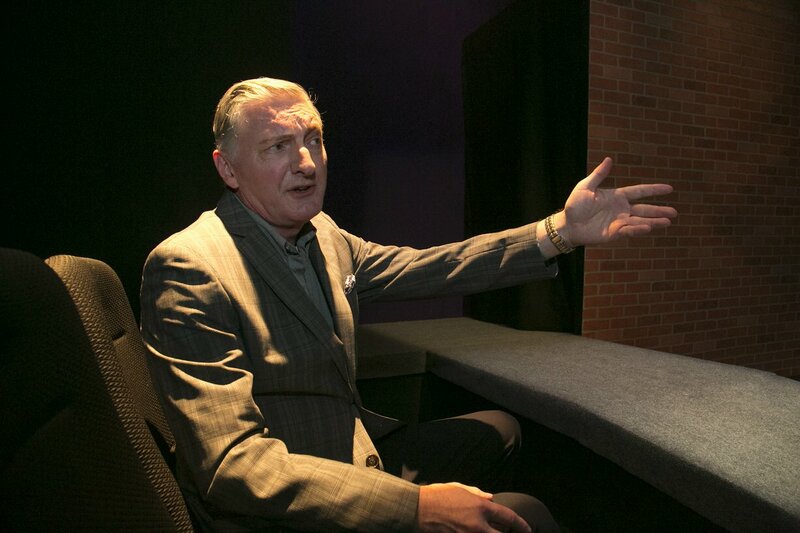 The show runs May 28-June 19 in the Studio Theater, directed by Jeff McGrath. Performances are Fridays and Saturdays at 7:30 p.m. and Sundays at 2 p.m. Events in the Studio Theater tend to sell out, so we recommend buying tickets in advance. Single-ticket buyers, buy online or call at 831-755-6816 / 831-375-2111. Season subscribers, thank you for your support! Welcome to the 2016 season. 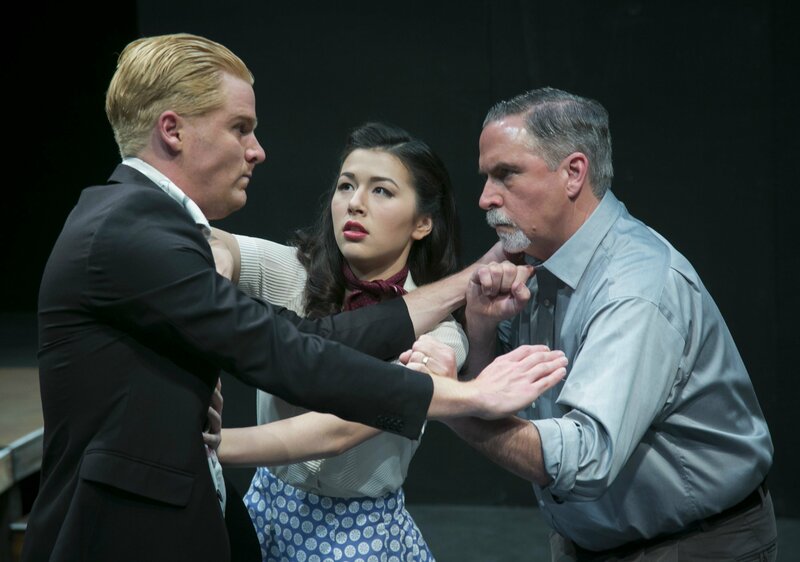 The Western Stage at Hartnell College is an acclaimed community-based theatre company that provides people the opportunity to share life-affirming experiences onstage, backstage and in the audience. We fulfill our mission through our commitment to inclusiveness, lifelong learning and to the highest artistic standards through educational opportunities and performances that engage our diverse community in a dialogue of ideas. To learn more, visit us online at westernstage.com. 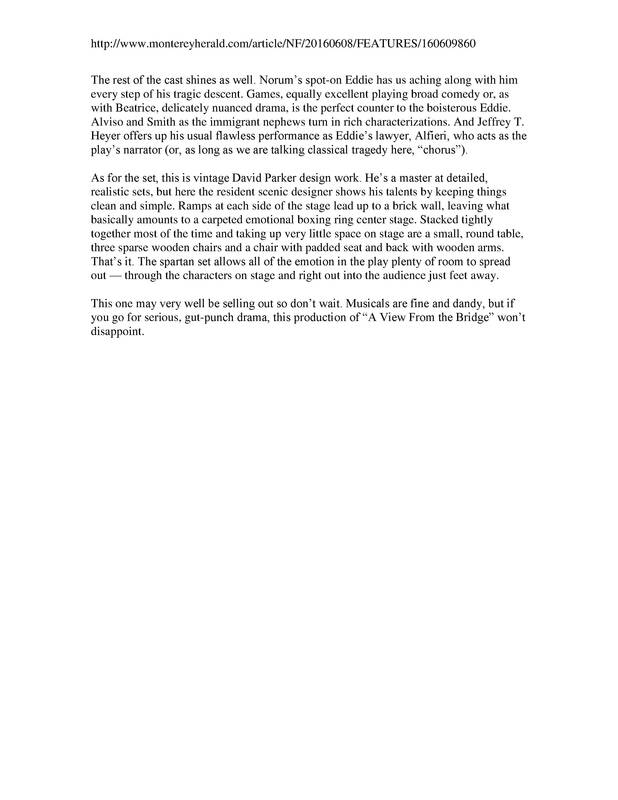 Copyright © 2016 The Western Stage at Hartnell College, All rights reserved.